January 22 – A French player power dispute has intensified with the country’s National Professional Footballers’ Union saying Paris Saint-Germain have “no right” to exclude Adrien Rabiot from their first-team setup simply for refusing to sign a new contract. The midfielder has been at loggerheads with the PSG hierarchy in recent months with his present contract expiring at the end of the season. Widely linked with a move to Barcelona, he has been indefinitely benched by PSG after being brought through the club’s academy and has also received support from the players union FIFPro. “From a legal point of view PSG have no right to make Adrien Rabiot train with the reserves,” UNFP spokeman Stephane Burchkalter told Goal, warning of possible sanctions against the French giants. 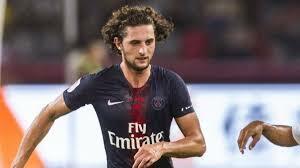 The contract rebel’s deal expires at the end of the season and the French league (LFP) confirmed on Monday that Rabiot has taken the matter to their legal committee, claiming PSG’s decision to exile him goes against the “professional footballer’s charter”. The charter only allows for players to be ordered to train apart “on a temporary basis” and for “exclusively sporting reasons”. Another ex-PSG player, Hatem Ben Arfa, was also frozen out and ordered to train with the PSG reserves last season. He joined Rennes at the start of the current campaign.